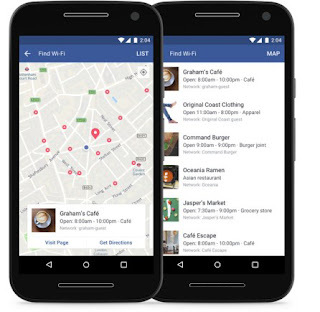 Facebook last year tested Find WiFi feature on its app,that let’s users finding free public WiFi near their location,this feature was initially launched for selected countries in the year 2016 ,the same has now been expanded globally and is available for all the facebook app users,Find Wi-Fi everywhere in the world on iPhone and Android, Facebook after the launch of Find Wi-Fi in a handful of countries last year,found it’s not only helpful for people who are traveling or on-the-go, but especially useful in areas where cellular data is scarce. To find Wi-Fi hotspots, open your Facebook app, click on the “More” tab and then “Find Wi-Fi”, Once in the “Find Wi-Fi” tab you may need to turn it on, You can then browse the closest available hotspots on a map, and learn more about the businesses hosting them. This stands to be an outstanding feature from facebook ,users don’t need to worry for mobile data while traveling outside their houses,instantly search and locate the free WiFi hotspot near to your location and get connected for free,The feature is applicable for facebook app across android and iOS platforms.